What's a Glacier Visitor Center with No Glacier? It took a 2008 family vacation to Seward, Alaska, for a Missouri businessman to begin focusing on the changing climate and its impacts. Years ago, businessman Larry Lazar thought global warming was shaky science — a topic debated on the news, but not something he took seriously. That changed during a family vacation. A photograph from the 1990s proves the glacier could once be seen from the visitor’s center. But just a decade later, Lazar’s family had to take a long boat ride up the lake to find it. Today, Lazar is a presenter for the Climate Reality Project, helping educate other Americans about global warming. 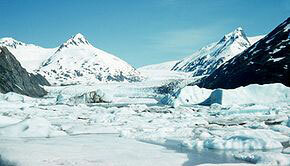 Photo: Portage Glacier has retreated substantially since this image was taken in 1958 (source: Wikipedia).